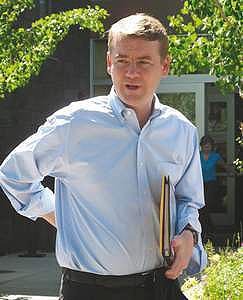 ASPEN – This year’s Western Slope College Fair will be attended by more than just high school students, their parents and school representatives, as U.S. Sen. Michael Bennet is slated to give the opening address Sunday. Bennet, a former superintendent of the Denver Public Schools and current member of the U.S. Senate Committee on Health, Education, Labor and Pensions, “is widely recognized as an advocate for student achievement and is working to help prepare our kids to compete in a 21st century economy,” according to college fair organizers. Also in attendance at the event, slated for Sunday from 11 a.m. to 2 p.m. at Aspen High School, will be Dr. Diana Sirko, a former superintendent of the Aspen School District who is now deputy commissioner of the Colorado Department of Education. In fact, more than 1,500 students and parents from across the Western Slope are expected to attend the fair. Students will come to Aspen from as far as Durango to Grand Junction and Telluride to Mancos; many take buses to the event thanks to funding from College in Colorado. As such, it is the largest college fair on the Western Slope. Toward that end, the fair offers students and parents a chance to meet with representatives from 220 colleges, universities, community colleges and technical schools; the reps will display information specific to their schools, answer questions about degrees and programs offered and explain the application process and requirements. The Western Slope College Fair is also unique in that it offers a slate of free workshops for students and parents, including “How to Pay for College Without Going Broke,” “An Insider’s Guide to the College Application” and “The College Bound Student Athlete.” Several workshops are also offered in Spanish. And new this year is a way to get younger students engaged in the fair – a scavenger hunt. According to Peirce, high school freshmen and sophomores will be offered a morning seminar explaining what the college fair is all about, and then sent on a hunt during the event. “It can be overwhelming,” she said. “So we work very hard to make the fair welcoming and fun.